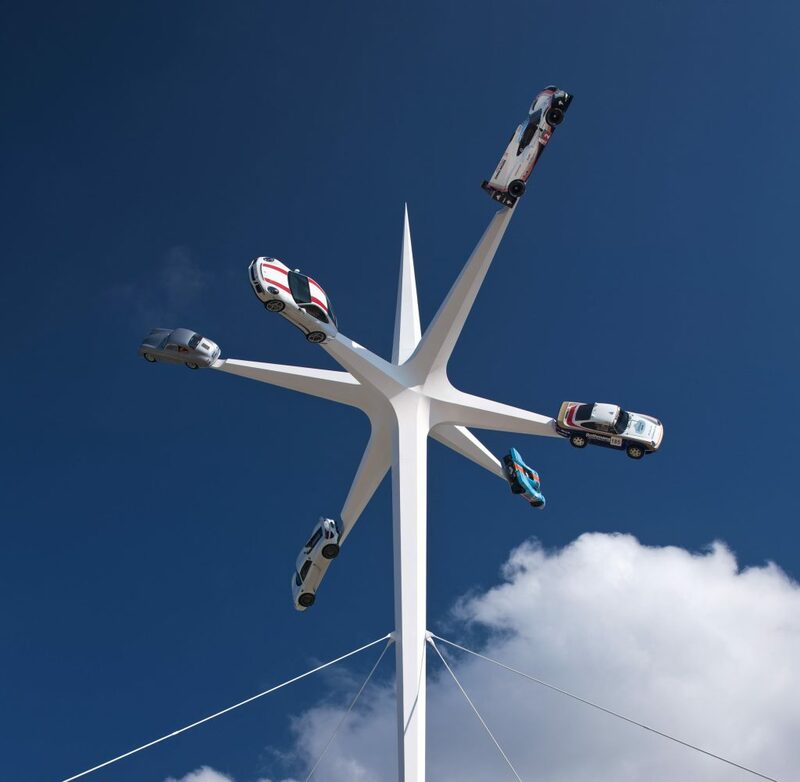 The latest sculpture at the annual Goodwood Festival of Speed features six Porsche cars attached to a 52-metre-high star-shaped white structure. 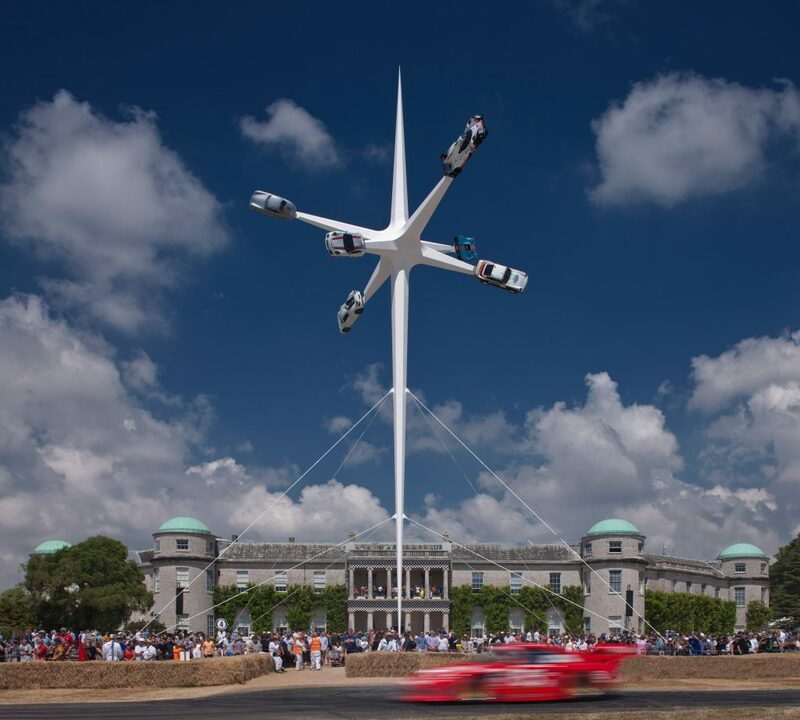 Standing in front of Goodwood House in West Sussex, England, the sculpture at the 25th annual Festival of Speedwas designed by British artist and designer Gerry Judah. It was created to mark 70 years since the first production Porsche was introduced. Released in 1948, the two-door Porsche 356 was the first car manufactured by the German company. This historic car is placed on one of the tips of the seven-pointed star, with five other Porsches from the past 70 years attached to other tips. The sculpture features two other notable historic Porsches: the 917, an endurance racer driven by Steve McQueen in the film Le Mans, and the 959, which was a winner of the 1987 Paris Dakar rally. Alongside these vehicles are three modern Porsches: the 918 Spyder, which is a hybrid road car made in 2015; the 919 Le Mans Prototype from 2015; and the 911R, a road car introduced in 2016, which is included to represent up-to-date Porsche design. 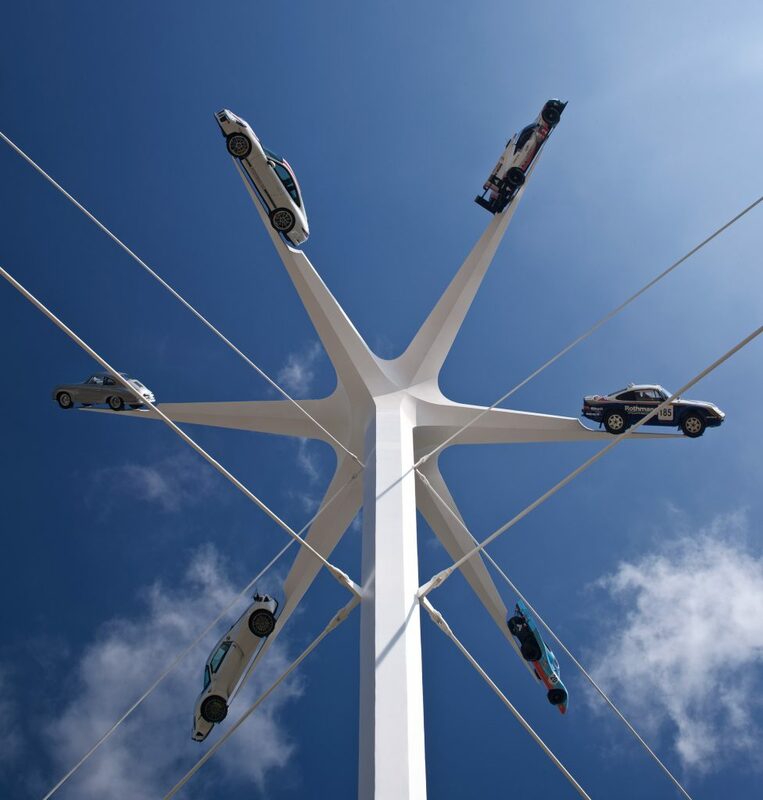 Weighing six tonnes in total, the cars are all supported on the narrow pylon, which is only 98 millimetres wide at the ground. This 21-tonne structure is constructed from hexagonal tapered tubes that are fabricated from laser-cut steel plate. 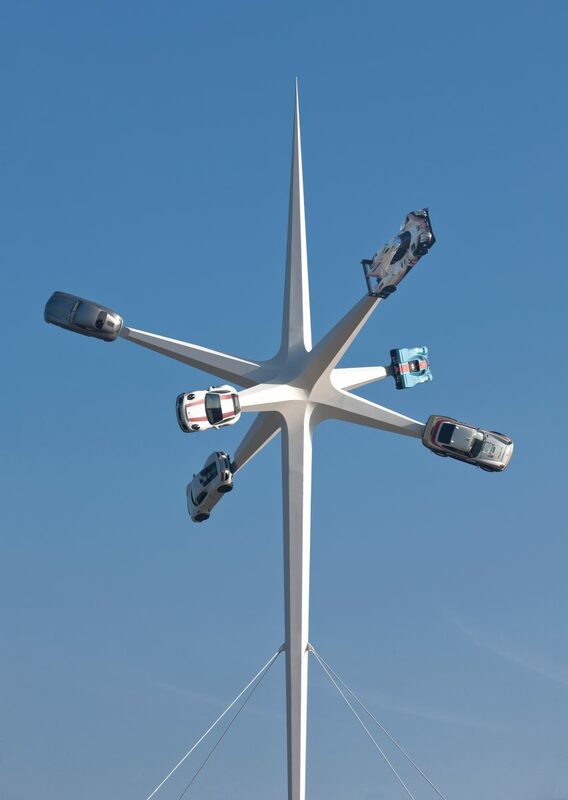 "The geometry is based on a regular truncated octahedron – this shape giving positions to display all six cars, with a stem at the bottom and a spire on top," said Judah. Judah has been commissioned to create a sculpture at the festival each year since 1999. Last year's piece featured five Formula One cars to represent key moments in the career of Bernie Ecclestone. Judah has incorporated Porsches into his designs before. 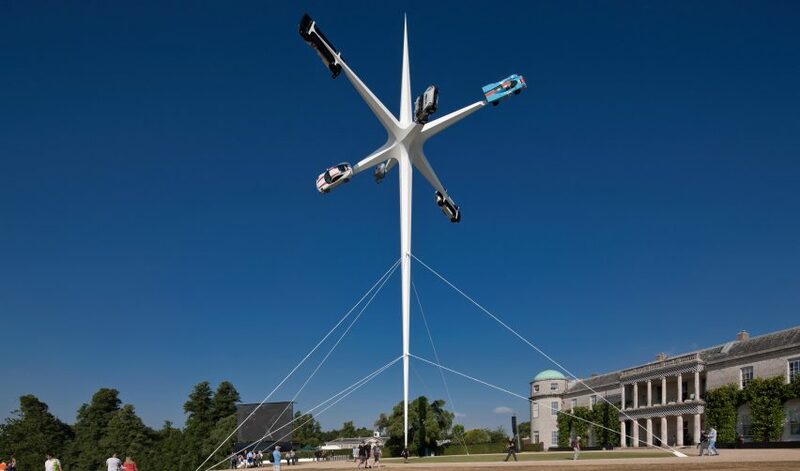 In 2013, his sculpture at Goodwood featured three Porsche 911s soaring into the sky. And in 2015 he designed a structure outside Porsche's museum in Stuttgart that also contains three generations of Porsche 911s.